I’ve paid my respects to two different families, at two different funeral homes, in less than 7 days…and this is what I’ve noticed…service excellence is definitely in the attention to detail (or lack there of). While departing the first of these two facilities, I chose to walk along a corridor leading to the side door and parking lot. Although not on the main thoroughfare, this corridor still included two parlour rooms, each with the family names (of the respective departed) adorning the doors. The first door was closed, the room quiet. The second, although empty, was wide open for all to easily view the dishevelment of a scene that looked like the leftovers from a wild party. You know, random paper debris scattered across the floor, bits of flowers here and there…easel boards with empty picture frames which once housed, only an hour or so earlier I suspect, photos of the deceased with family and friends from happier times. And there, amidst the disarray, was the deceased himself, lying serenely in an open casket, hands folded neatly across his chest. This picture could easily, if not somewhat cynically, been entitled, “The remains of the day”. Although a stranger to me, in that moment, I felt a connection and sadness for the memory of this person. True enough, he didn’t care anymore, but still…this should never have happened. Some employee at this funeral home truly “dropped the ball” when leaving this door open, displaying for passers-by this man’s body among the “ruins”…like a discarded party leftover. It was a heart-breaking site and seemed oh-so-disrespectful/dishonourable to his memory (whoever he was). From this one little moment, I know that I would never recommend this funeral home. A company or organization’s commitment to/demonstration of service excellence is definitely in the attention to detail (or lack there of). You only have one shot at making a first impression. Just one. Your livelihood (no pun intended) depends on it. At a funeral parlour across town, just a few days later, I was over-the-top impressed with this company’s attention to detail. Right down to the abundance of candy dishes filled with–for hygiene’s sake–wrapped sweets. After all, there’s always a lot of hugging and close talk while paying respects and one’s breath may very well need some freshening-up–right? How very attentive, indeed, I thought, as I unwrapped the little package containing three individual candies. And then, in that split second, I saw it…what might be considered a little professional “faux pas”. These candies were none other than…Lifesavers! Get it? Get it? Is it just me or do you, too, see that maybe–just maybe–another candy choice would work better? 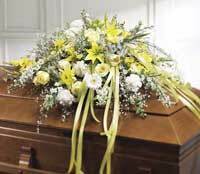 As I left the funeral home, I shared my insight with the funeral director who just happened by. He was truly mortified (no pun intended!) and was sincerely astonished that they’d missed this little attention to detail….when they all try so hard. I reassured him that it was probably just me that saw the dark humour in supplying Lifesavers. Still, he declared all Lifesavers would be promptly replaced with another choice. And they were. Amazing responsiveness to feedback and amazing attention to every last detail.